Spring is on the way which means Easter is near. 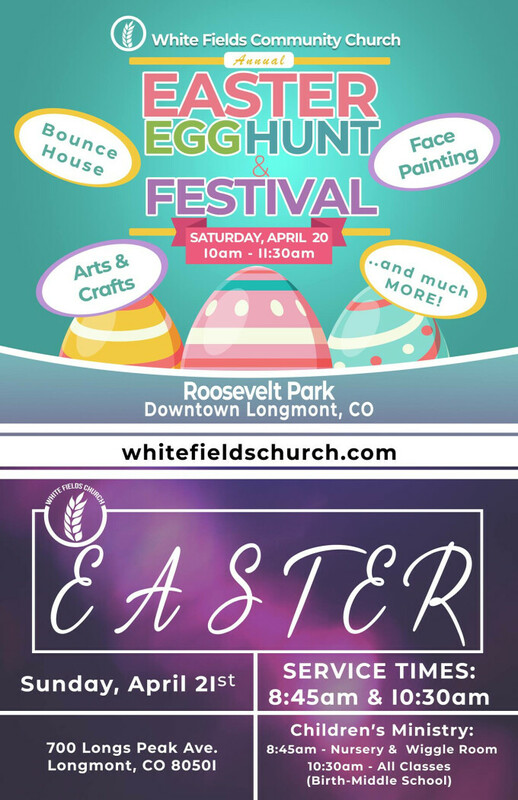 At White Fields, we are privileged to host the largest Easter Egg Hunt and Festival in Boulder County every year in Roosevelt Park. This year's event will be on Saturday, April 20, at 10:00 am. There will be a variety of fun activities. We will have face painting, bracelet making, a puppet show, and bounce houses/obstacle course. This is a great time for the whole family. On Sunday, April 20 at 8.45 and 10.30 a.m. Pastor Nick Cady will give a message of hope in the risen King Jesus.